A box of oil can be a very good thing. Assuming you remembered to order the filters too, you can rest easy that you've enough oil for a multitude of of oil changes, knowing that you got that oil for a good price. It's like money in the bank, except that it's oil by the box. Your motorcycle's motor needs oil. Parts must move, and as the crank-bone's connected to the rod-bone, the rod-bone's connected to the wrist-pin, etc., better that they move together with some lubrication between them. It's usually best to refer to your owner's manual for SAE viscosity recommendations as well. More words on SAE ratings: The "W" on multi-viscosity oils refers to Winter Grade, meaning these oils have been tested in cold temperatures. If the oil performs as expected for a SAE 10W at cold temperature, then flows like a SAE 40 at high temperature (210 degrees Fahrenheit or 100 degrees Celsius), this receives a 10W-40 designation. For clarity's sake, the only time the oil runs at the low-viscosity is when the engine is cold. At operating temperature, the oil performs at its higher SAE designation. 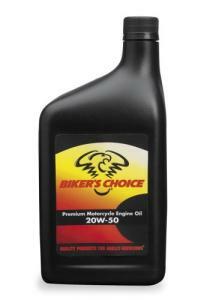 Biker's Choice sells their Premium engine oil by the bottle, case, or even in a 55-gallon drum if you're really ambitious. Be aware that this is their non-synthetic oil; if interested, they also offer synthetic, transmission, and chain-case lubricants, but sell these latter options only by the bottle.